After Tom I decided for the Ambler biped robots to revert back to two servos and the size of BigFoot and Toddler but still kept the tilt rods at the rear. This was a very successful design. The first Ambler Pop, aka Sam, with the batteries on the feet now walked much better and faster than Toddler. I decided to build a slightly different version Mom, aka Efi, with the batteries on the body. The walking action is different because of the increased mass high up and the reduced mass of the feet but Mom is just as good a walker as Pop. After building Junior these just had to be Mom and Pop especially as they are smaller. Although at slow speed the Amblers walk using predefined gaits, at fast speed, the frame and tilt rods, because they are flexible, store and release energy throughout the walking cycle, consequently the Amblers are Active Dynamic Biped Walkers with Limit Cycle Control. The software for Tom and all the Amblesrs and my later robots follows the same scheme. The program, in the case of Tom, Sam, Efi, and Joe is written in Parallax's Control Basic and originally they all had a Basic-Stamp-2 (BS2) but Tom and Kas have been upgraded to a BS2e (with 8 times as much program space) to have room for the speech control. The program creates the structure of their brain and the commands for the robot are held in DATA statements and are interpreted by the brain. Using the Parallax IDE, because it is so fast to edit and download a proram (including DATA), it makes development and changing what the robot does, very easy. Each robot has an initialisation Act and up to sixteen default Acts. The chosen default Act will run and then repeat and repeat. The default Act can be changed by a Hex switch or selection circuit. The commands for Sam are single ASCII characters, some are followed by single character or byte parameters. For the other Amblers the commands are defined constants and hence the DATA is easier to read since command names can be used. 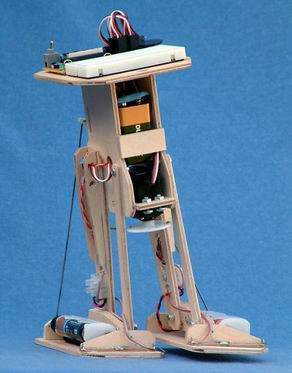 Following on from BigFoot, Ambler, designed by David Buckley, is the latest generation of two servo biped walkers. The kit is aimed specifically at the beginner in electronics and robotics and comes with the control-board already assembled. No special knowledge of electronics is required and the kit is easy to assemble using a small screwdriver, a pair of pliers and wood-glue. 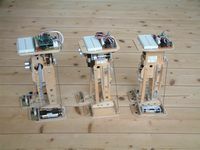 Ambler uses two servos to achieve real walking, rolling from one foot to the other as it walks forwards, backwards and turns right or left all under the control of a Basic Stamp2 from Parallax Inc. or with any other compatible module. Ambler stands about 24 centimetres high and weighs 560 grams (9.5" high, weighs 20oz), has an onboard Sounder, UserPot and large Breadboard area. Requires four AA cells and a PP3 9v battery. requires four AA cells and one PP3 9v battery. 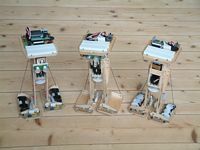 The two servos allow Ambler to shift its weight from one foot to the other and thus lift either foot and to move its legs forwards and backwards. Turning is done by standing upright and sliding the feet in a tank style turn. A simple fully documented Basic program is provided. The supplied program operates Ambler in a static balance walking mode. The two toe switches, one on the front of each foot, are activated when the wires seen in the photo touch obstacles. Ambler can then be made to step back and turn away. Ambler is available from Milford Instruments.